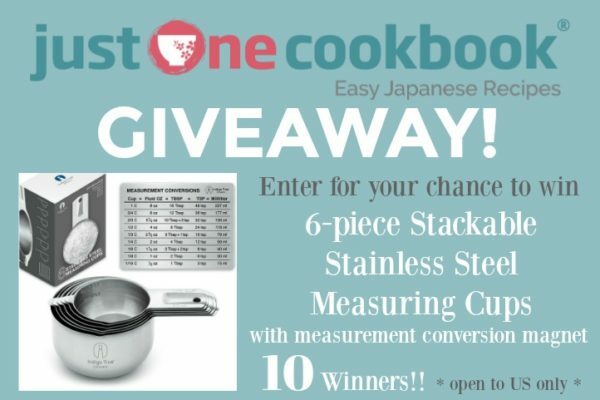 I’m partnering with Indigo True Company today to give away 6-Piece Stackable Stainless Steel Measuring Cups to 10 lucky JOC readers! The contest is open to U.S. residents only. Because I shoot multiple recipes in one day, I own 3 to 5 sets of (almost every) kitchen tools so I don’t have to do dishes during shooting. Among 5 sets of measuring cups I have, only one brand satisfies my desire to keep everything organized. And that’s the Indigo True 6-Piece Stackable Stainless Steel Measuring Cups. See? You now know why. Indigo True measuring cups take up the least amount of space as they stack up neatly. I should have 5 of these! – durable and dishwasher safe, no rusting. – Measurement conversion chat magnet designed by Indigo True. You can read more about this product or other cool products at Indigo True website. These measuring cups are also available on Amazon. 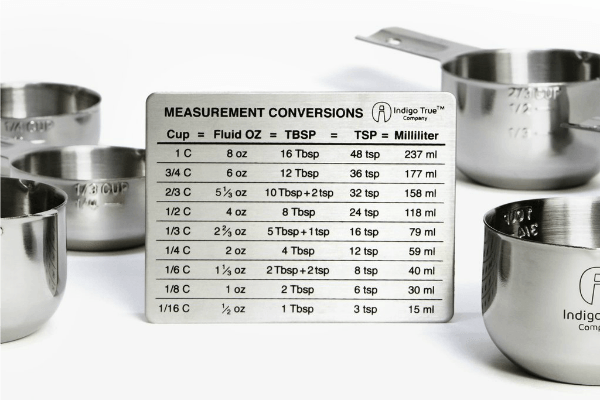 The measuring cups come with a Measurement Conversions Magnet. 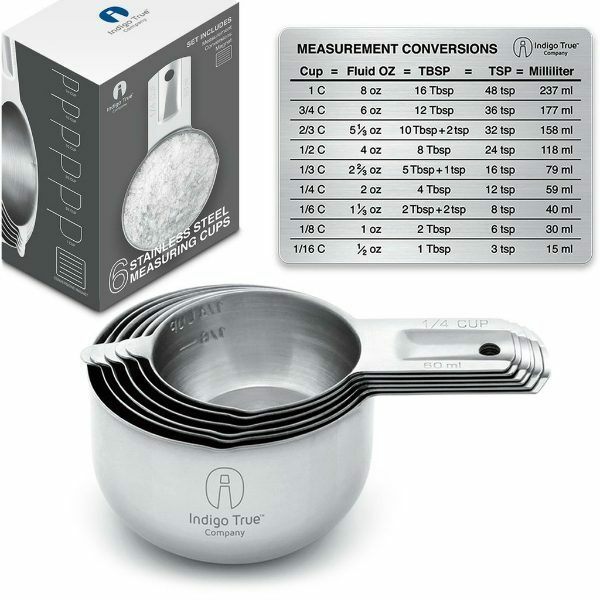 I’m partnering with Indigo True Company today to give away 6-Piece Stackable Stainless Steel Measuring Cups to 10 lucky JOC readers! This giveaway contest closes on Wednesday, June 28, at 12 p.m. PST and is open to U.S. residents (due to shipping logistics – more international giveaway coming soon!). Ten (10) winners will be selected via Random.org and contacted via email, so please include a valid email address in the email address entry box (please double check your spelling!). Ticket 2 (Optional): Like Indigo True Company Facebook and then leave a separate comment below on this post. Full Disclosure: This giveaway is sponsored by Indigo True Company. Congratulations to StaceyN (#165), Lisa (#32), Ben (#387), Carol (#45), Emilye (#348), Julie (#95), Julie (#264), Karina (#29), Hesper (#162), and Calvina (#69). I’ll email you shortly. Very cool stackable measuring cups! Hello! I already am a subscriber to your email newsletter! Hi..,I already like your FB page! Thanks! I already like your Facebook page. Does that count? Just liked Indigo True Company’s Facebook page. These look very nice. I just had to retire a set that was falling apart and this would be a much needed replacement. It looks like a great set of measuring cups. Would love to be a winner. Have a great trip to Japan. I am hoping that we can do the same in the near future. Hi! I subscribe to your newsletter, instagram, FB, and YouTube! I love getting your recipes via email Nami, they are always mouth watering. I’m not the best cook there is but your recipes and video make it a bit easier for me, thanks! Have a wonderful day and keep cooking. Oh.Wow! These are soooo much better than my plastic ones I picked up at a dollar store years ago! I would love a set a of these! So nice! I’m a subscriber to your blog, and youtube channel. Love your recipes! I Also liked indigo blue on Facebook. Best blog ever for Japanese food. I love this site. I love this blog. 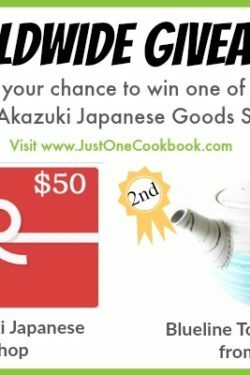 My only “go to site” for Japanese recipes. The videis are great!! Love all of the recipes and look forward to the emails. I have subscribed to your email nesletter. I have liked Indigo True Facebook page. I have like Just One Cookbook Facebook page. Liked indigo true company on FB! 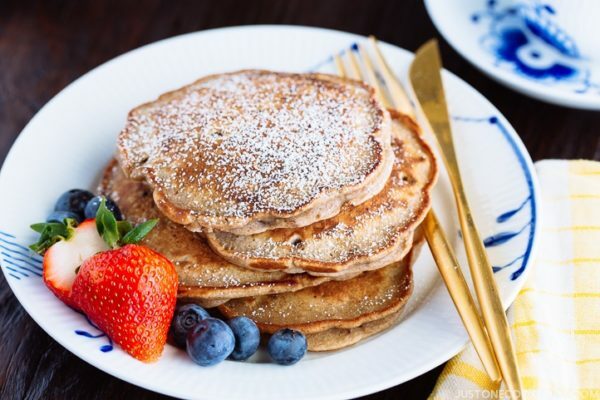 I love the simple, tasty and interesting recipes on JustOneCookbook, and Nami’s unfailing enthusiasm. We all could use more Nami umami in our lives. Ticket 1: Subscribed to your email newsletter and look forward to seeing it each time! I love to try Japanese recipe using common ingredients you can find in regular grocery stores. Ticket 3: Liked you on Facebook! Love your posts! Ticket 2: Liked Indigo True Company Facebook page! Thanks for the chance to win the measuring cups! I used to think Japanese food was too difficult to make at home until I began watching your videos. Now I regularly cook Japanese meals for myself. Thank you for being a great teacher, Nami! Hi, I already subscribe to your newsletter! Thank you. Hi, I already subscribe to your IG Thank you. Hi, I just subscribed to your You Tube channel! Thank you. Enjoy your great recipes for family meals! Those measuring cups are both nice looking and useful. 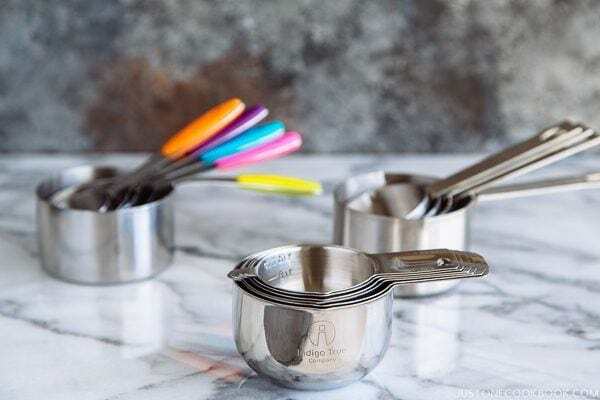 Love the idea of stackable measuring cups! Love the space saving stackable idea of the measuring cups. Liked Indigo True on FB. 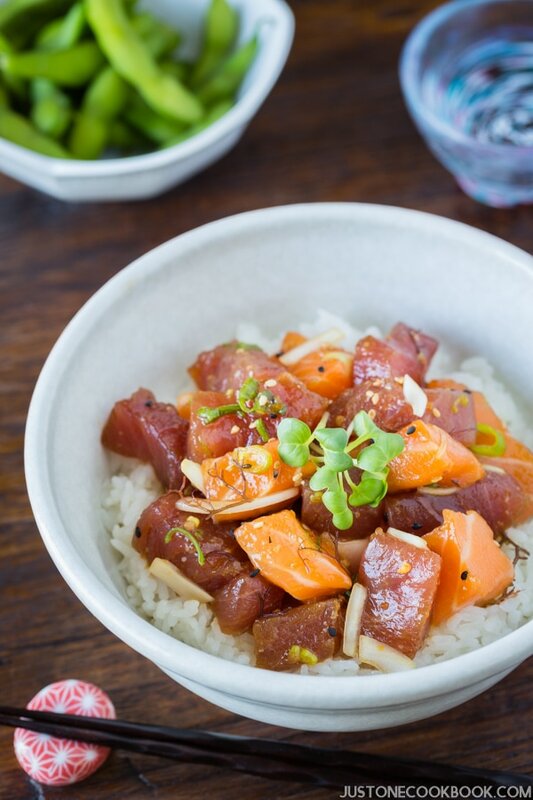 Looks like they have a good array of easy Asian recipes on their site! I like and follow JOC feed on facebook. Thank you for chances! I follow and like JOC Instagram. I like Indigo True Company on facebook. I never had a measuring cup that I liked this will be interesting . Been subscribed to your newsletter for a while now and love reading your upbeat posts and being inspired by your recipes. Thanks for another great giveaway opportunity. I’ve been looking for a new set of measuring cups. These look perfect! I envy you and yours leaving for Japan. It’s been sixty-two years since I lived there and forty-two since my last visit. Do you have room in your luggage for a stowaway? Nami, thanks for recommending Midnight Diner! I lived in Ibaraki-ken for 5 years and it made me miss Japan. I binge watched it and now I am hoping they release Season 2 and 3 to Netflix. I really enjoyed this first season very much and I can’t get that song out of my head! I really enjoy the recipes on JOC- enjoy eating ,too. Always well written and video is perfect! Hi Nami! Thanks for this giveaway. I also have an assortment of measuring cups and spoons so I don’t have to wash up (along with a second set of Kitchenaid beaters and bowl). I still have the same stainless set I bought decades ago–they’re not my prettiest set but still functional. Would love a set of these to add to my collection so I can donate some of my plastic ones. I love this website! I use this when I need something to cook! I subscribe to your email newsletter. Love these cups! I follow your YouTube channel @Deborah W.
The best design I’ve seen so far. Saves lots of space. Very neat and no handles sticking up or sideways. Liked Indigo True Company on Facebook. Subscribed via email, with the email used for this comment. Thank you! Great stackable measuring cups ! I’m subscribed to your JOC YouTube channel. Liked your facebook page, new fan and enjoying the content! Love your recipes! Have fun in Japan! The measuring cups look neat and sturdy as you said. I like the fact that they are made from quality stainless. Thank you always for your great work, Nami-san. 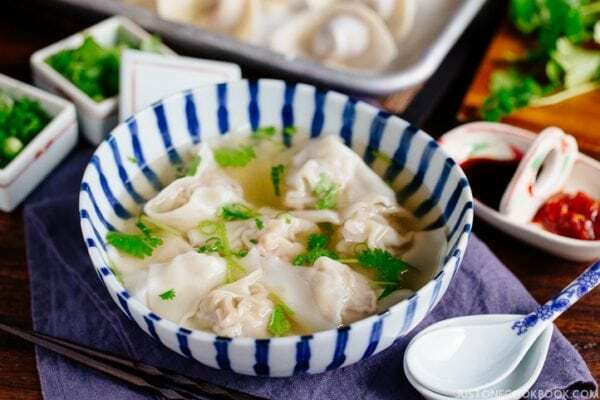 I can’t wait to make the shrimp/port wonton soup. You make it look so easy and good! I like how the Indigo True measuring cups handles best together so perfectly. And the cups are chubby cute! I liked Indigo True Company’s Facebook page. Already subscribe to your awesome YouTube channel!! Just started following you on Instagram. Hi! I love your recipes and videos! Already subscribed to newsletter ???? Already follow you on Instagram! Under recipetestingtesting123 ✌???? I’m subscribed to your email newsletter! Thanks for sharing your recipes! Already subscribed to your YouTube! ???????? I really enjoy your blog and making your recipes. Those are really cool measuring cups!! And I did sign up for your newsletter, I love your site! 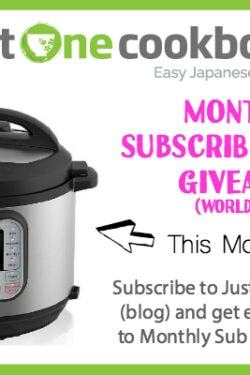 I enjoy your recipes – would like to see more Japanese, slow cooker, and instant pot recipes. Thank you! I subscribe to your enewsletter. Love them. Thank you! I already follow you/like your page on Facebook. Always great to see your posts! Woohoo! Measuring cups that will make it possible to close the kitchen drawer. Sign me up! Would LOVE ❤️ These measuring cups ???? I love your recipes. Easy to follow and reminds me of my grandma’s cooking. I hope I win 🙂 here’s my entry! I am a newsletter subscriber! ???? I subscribe to you YouTube channel! Have a I missed an episode on how to make ramen noodles? 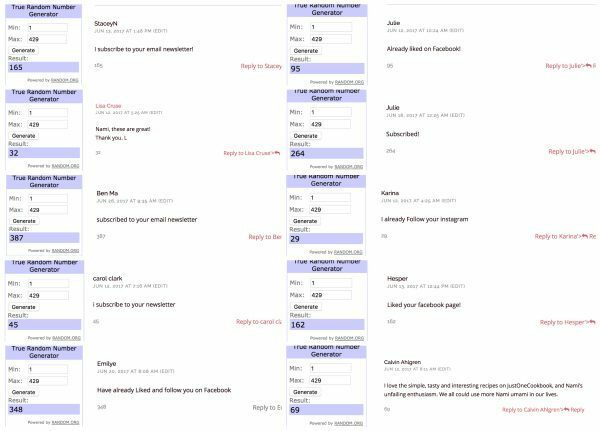 Commenting for an entry feels weird when I have to comment multiple times on the same page. ???? Just subscribe to your email newsletter! I’ve been following your fb for a few months now & I lovveee all your recipes. I don’t have a YouTube, so I have to stop now. 🙁 Lol. I just liked Indigo Ture Company Facebook page! I have also subscribed to your YouTube! These would go great with my new place! Your FB page inspires me to cook more! Hello Nami san, I’ve subscribed to your newsletter! I like this kind of measuring cup because I’m new for cooking of good food and nice desses for my family thanks . I would love a set! I need something that takes up less space! Love your site and cooking! ???????????? Hi. !im Melogen,I always watch your just one cook book,recipes,and I love it all,thank you for sharing. Great to have nice stackable measuring cups. They look sooo pretty! Wish me luck????! Hello Nami san, I’ve liked your Facebook page for awhile now! Hello Nami san, I’ve been following you on Instagram for awhile now! Hello Nami san, I’ve liked the Indigo True Company Facebook page. Hello Nami san, I subscribed to your YouTube channel! I would really love to win this! Will be an awesome addition to my kitchen. I follow you in all social media Nami-san❤ Yoroshiku! I follow you on FB Nami-san❤ Yoroshiku! I liked Home Cooking Group (Indigo True) on FB! Please make me a winner! I love your recipes! thanks for the opportunity! These measuring cups look so nice! Tried many of your recipes. First place when I need to find a dish to cook. Good Morning Nami !!! Happpppyy Weekend !!! Those measuring cups look handy! I am following your Instagram. I’ve subscribed to your YouTube channel. I’m subscribed to your email! I’m follow you on instagram! Liked Indigo True Company Facebook page! Would love a new set of measuring cups! Looks like a wonderful item to use in the kitchen! Count me in. I’m already subscribed and love it when I see a new recipe in the inbox! I follow Indigo True Company Facebook on FB (Rose Schmidt). I am so thankful for this website’s receipes, it allows me to open up my home menu and feed my family much more than western american (poor diet) foods! thank u u u!!!! E-mail about your travel experiences in Japan. I’m subscribe to your emails. Love your recipes. this is my entry for subscribing to your newsletter. this is my entry for subscribing to your youtube channel. this is my entry for liking your facebook. You always need accurate dry measure measuring cups. As always look forward to you blog. I am already a subscriber to your newsletter 🙂 thanks for hosting all these giveaways! These look like awesome measuring cups!! Subscribed your Email Newsletter! Looking forward to all the wonderful giveaways and recipes! I’ve subscribed to your newsletter ???? I’ve liked your page on Facebook ???? I’ve liked Indigo True Company on Facebook ???? I liked Indigo True Company’s FB page. I liked the company Facebook page. These will fit great in my drawer! I liked your Facebook page! Love the recipes! The Indigo True Company FB page has a lot of cool stuff! I just liked it! I love your videos on your YouTube page! I love just one cookbook recipes because they are incredibly tasty and easy to prepare. Especially with the instructional videos. Thanks Nami!! I love just one cookbook recipes because they are incredibly yummy and easy to prepare. Especially with the instructional videos. Thanks Nami!! I love these measuring cups. I’ve been your avid follower…and i enjoy learning more Japanese food through your blogs. Thank you!!! Thank you for all the wonderful diahes. Your blog is always such a joy to read! Hi Nami. i subscribe to your newsletter and Instagram–i’m enjoying your Japan travel blog. The food and places are amazing! Just found this page and I love it! Could use a new set of GOOD measuring cups. These look like they will satisfy. I also subscribe to your YouTube! You are always so generous with your giveaways! Thank you so much! Stainless AND stackable? I’m in! I follow your You Tube channel @Deborah W.
Oh my god, I would love to win this! My measuring cup set is broken and this would be a great replacement. Best e-cookbook recipes ever! Love your website!! Thank you for sharing your recipes! I find them to be easy to make such as your soba recipe. Hi. I’m already subscribed to your newsletter. Hi. I already follow you on Instagram. Hi. I already “Like” on Facebook. Hi. Already subscribed to YouTube channel. I’ve been fascinated with Japanese food and culture for several years now. and this website has been amazing. I love all of the recipes that I have been able to try so far and I look forward to trying more soon. I have liked the facebook page for just one cookbook. I look forward to sharing your recipes with my family and friends.